WHERE: You can provide opportunities for your child to play with water in the bath, in the kitchen sink, in a washing up bowl or a baby’s bath, weather permitting, in a paddling pool or bins with water. PREPARE FOR A MESS: This type of play is likely to lead to some mess, but your child should not feel under pressure to keep dry or not make a mess. It is better to try to encourage children to limit the mess and for them to help clean up afterwards. THE VALUE OF SENSORY PLAY: Sensory play is a valuable part of quality early childhood programs. Children are provided with sensory materials used to enhance their senses of touch, sight, taste, smell, and hearing. The use of sensory materials allows children the opportunity for hands-on and self-directed play to encourage the development of fine / gross motor skills, creativity, self-esteem, social development, and cognitive development. 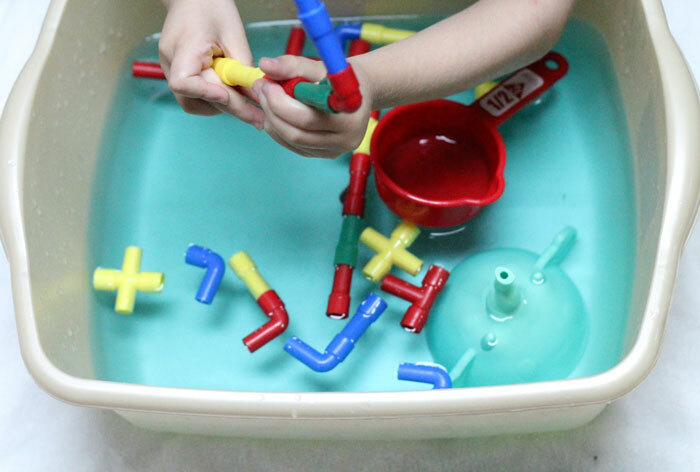 Water play in a basin, with measuring cups and toys for hours of fun! The staff at Creating Together are trained in helping children achieve indicators of success in a number of key areas of development. While many of these were shared in our information session this month, we wanted to include them here so you can be more informed when playing with your child, so you too can encourage their development and success! Fine Motor – holding objects with hand. Coordination – holding and transferring object from hand to hand; manipulating small objects with improved coordination. Tactile – tracking moving objects with eyes; touching, rubbing, squeezing. Words with Gesture – speaking with words and gesture. Moving forward, we hope you’ll take the dive and explore the benefits of water play with your children!